The large green bus left Highway 101 at Oceanside, California, to turn into Marine Corps Base Camp Pendleton in northern San Diego County. All four platoons from our series (371 – 374) had boarded Greyhound-type buses owned by the Department of the Navy early in the morning of December 13, 1963. Marine Corps. Missing a movement was a court-martial offense. Orders directed us to report to the 2nd Infantry Training Regiment, which we called ITR. The 1st regiment trained at Camp Lejeune in North Carolina to train men from Parris Island. We were to spend about a week at Camp Pendleton before the Marine Corps granted us Christmas leave. The thought of returning to civilian life made me giddy. 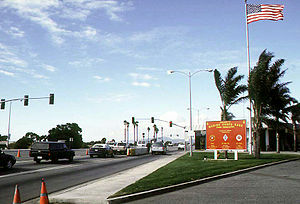 The buses passed through the Oceanside gate heading for Camp San Onofre, the home of 2nd ITR. The Marine Corps had created Camp Pendleton in 1942 on 125,000 acres of a former Mexican ranch. The ranch house – which held an Episcopal chapel I attended — served as base headquarters. The name Camp Pendleton honors Major General Joseph H. Pendleton, who pushed to create the base. Since World War II, the base has been home to the 1st Marine Division. But the base also houses training commands, such as 2nd ITR. 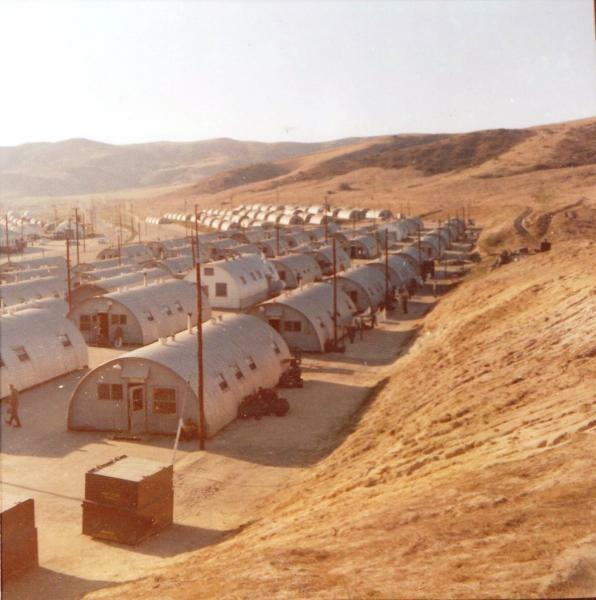 Caption From Lady Leatherneck Forum: ITR at Camp San Onofre at Camp Pendleton . The view is the company street, from one row west of [the photographer’s Quonset Hut], over the top of the rifle bench towards Horno Ridge. Beyond the ridge is the Pacific Ocean. The top of the mountain is shrouded in low-hanging clouds. Camp San Onofre was a disappointment. After the Spanish architecture and polish of the Recruit Depot, we pulled up into an area of a few wooden buildings and dozens of Quonset huts that housed trainees. The area seemed squalid. The troops lived in larger Quonset huts than those at the Depot. We did not live under the constant presence of a non-commissioned officer, and our evenings were our own. But our area lay in the Sierra Nevada range in which winter had set in. A large oil-based heater warmed our hut, but cold set in a few feet away from it. We could not keep warm. Our series became “C” Company, known to us as Chickens**t Charlie Company. Our company commander, whose name began with a Mac and who affected dark glasses, we knew as Captain MacArthur. I remember none of the names. In place of drill instructors we had troop leaders, the non-coms who ordered us around. They proved less sympathetic than our DIs, who seemed to want us to succeed. The troop leaders acted like petty dictators. Our main tormentor was a pudgy Irishman from New England, who traded off with a wiry black sergeant. The Irishman liked to take us off on rapid uphill hikes on Sunday afternoons. Many of my bunkmates from the Depot found themselves in 4th Platoon with me. But there were a smattering of men from the other units who I got to know. One in particular was a tall, woebegone 38-year-old artist who had served in the Navy in the late 1940s, 15 or more years before. Some cataclysm, a divorce I believe, had caused him to enlist in the regular Marine Corps for four years. It was the American version of the Foreign Legion for him. He seemed downcast over his decision. Our interests the first few days were sleep, food, and tobacco, pretty much in that order. Taps in ITR went at 2200 (10 p.m.) instead of 2100 (9 p.m.) as at the Depot. That cut an hour off our sleep , because reveille remained at 0500 (5 a.m.). When you hump hills during the day, seven hours of sleep felt like insomnia. The battalion mess hall sat a few hundred yards away down the hill, and we no longer marched to chow in formation. We dressed and ate on our own, then reported back for the morning formation. But the food fell short of the food at the Depot. It was passable but not more. I recall eating a meal of fried chicken – only to discover I had eaten rabbit. The smoking lamp still had to be lighted, and the troop leaders watched us for surreptitious smoking. This took place at the head on the hillside (a head is the Naval bathroom), perhaps 30 or 40 yards removed from the huts. That required a climb up the hill. But there we posted lookouts and smoked. 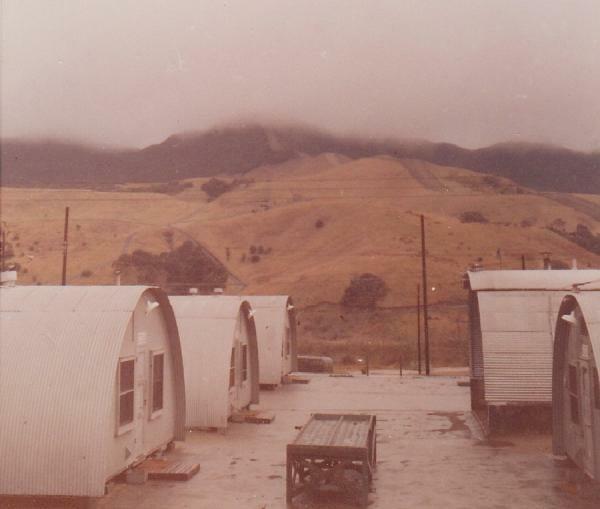 Caption from Lady Leatherneck Forum: This is Camp San Onofre, part of Camp Pendleton, California, up against the Horno Ridge, a part of the Sierra Nevada Mountains on a weekend afternoon in January 1961. The dark areas in the shade of the Quonset huts are groups of Marines relaxing and swapping sea stories. Every so often, a troop leader would ascend the hill to check for smokers in the head, but he never caught me. I had thought to myself in boot camp that the commanding officer ought to ban smoking for the duration. That might have cured me. Instead, I bought a newspaper one day at the mess hall (there was an actual newspaper rack, and we could read The Los Angeles Herald-Examiner every day). The lead headline reported that the Surgeon General’s Advisory Committee on Smoking and Health had concluded that smoking caused lung cancer and laryngeal cancer in men. I read the headline in the rack and bought the paper. I decided to quit smoking. That took me four-and-a-half years. We looked forward to departing from 2nd ITR almost as much as graduating from boot camp. That was in the future: right now we had leave to go home, in dress uniform, for Christmas. Jan, 61 . Navy “seabee” battalion 10, went there, while rotating back stateside from a 1 yr Guam deployment .